Delicate, tasty cream cheese pancakes are keto, low carb and gluten free. They are made with only three ingredients! These delicious low carb and keto cream cheese pancakes are made with just three ingredients. They are REALLY good, in fact better than flour-based pancakes. And don’t just take my word for it. My carb-loving kids adore these low carb pancakes and always ask for seconds. All you need are three ingredients – cream cheese, eggs and vanilla. Plus butter for frying the pancakes. Scroll down for the recipe card with the full instructions. It’s an easy recipe, with one caveat: The batter of these keto cream cheese pancakes is very thin. So you can’t just pour three mounds of the batter into a large skillet and fry three pancakes at a time, as you would with regular pancakes. The batter will spread. So either use two mini frying pans and cook one pancake at a time in each, or use a special pancake pan. I like to use this egg cooker pan, which makes perfect round eggs (great for keto breakfast sandwich) and also works great for thin-batter pancakes. How to serve keto cream cheese pancakes? The pancakes are delicious with no toppings. But obviously you can top them with butter, maple syrup or honey (if you don’t mind the carbs), or low-carb maple/honey. If you’d like, you can also add 2 tablespoons of a low carb sweetener to the batter (or the equivalent in stevia), and then you won’t need a sweet topping at all. Yes. Once completely cool, you can keep these keto cream cheese pancakes in the fridge for 2-3 days, in a sealed container, separated by wax paper squares. You can also successfully freeze these pancakes. Again, separate them with wax paper strips. I really like these almond flour pancakes. They are tasty and fluffy, and the batter is really easy to work with – easier than these low carb cream cheese pancakes. Another favorite of mine is these deliciously chocolatey low carb chocolate pancakes. Microwave the cream cheese for 10 seconds to soften it. In a medium bowl, whisk the eggs well with a hand whisk. Add the cream cheese and the vanilla. Whisk until well-incorporated and smooth. This will require some elbow grease, so be patient. Heat half the butter in two mini skillets over medium heat. Add 1/4 of the batter to each skillet. Cook until golden brown and set on the bottom, about 2 minutes. Flip and cook 1 more minute. Transfer to a plate and loosely cover with foil. Repeat with the remaining batter, adding more butter to the pans. 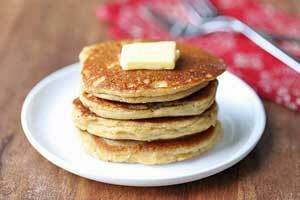 The pancakes are delicious with no toppings, but obviously you can top them with butter, maple syrup, honey, or low-carb maple/honey. Nutrition info does not include toppings.